This entry was posted in Vacuum Tubes and tagged TJ Full Music by tubemaze. Bookmark the permalink. First of all, I have to say that the tube is freaking gorgeous! This picture doesn’t do it justice. It’s huge and burns on the top like no other tube I’ve seen. Now about the sound. 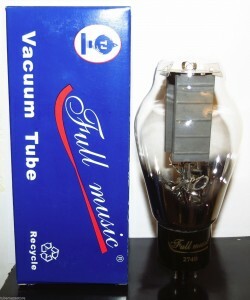 I compared this tube to 2 of my favorite rectifiers RCA 5R4GY and NOS Mullard GZ34. All tubes performed admirably, but with different results. Full Music 274B just sounded superbly transparent and was able to through a sound stage and air that was unmatched by another other rectifier that I tried. Bass was very strong and tight, but not as tight as in Mullard, but Mullard couldn’t come even close in transparency and air. RCA was much, much warmer sounding. So all in all, a fantastic looking tube with superb sound. HIGHLY RECOMMENDED.